CycleHack is a 48-hour event aiming to make cities cycle-friendly through reducing the barriers to cycling and prototyping new ideas to improve the cycling experience and encourage more and safer cycling. More than 40 other cities around the world have signed up to host CycleHack events in their communities over the weekend of 24 to 25 June, 2016. Cambridge, home of CycleStreets, will be joining cities around the world for a weekend-long CycleHack event, which will be held at Anglia Ruskin University and other locations where specialist equipment may be required. Participants will be encouraged to test their ideas and prototypes around town during the event. CycleHack was launched in 2014 in Glasgow and has since grown to a global event. In 2015 CycleHack had more than 600 participants from over 25 countries across five continents. 67% of participants were inspired to cycle more. In 2016 the event is set to be even bigger with more than 40 cities already registered. CycleHack Cambridge is hoping to attract a whole range of people from developers, makers and data scientists to non-technical artists, designers and those who are interested in cycling and have some great ideas. We also want to include representation from all corners of our diverse cycling community and want to see lots of students and young people taking part. This event will bring together the key elements of our Cambridge culture: cycling, innovation and technology. The event encourages participants to prototype and test their ideas during the weekend to see how they will work in their intended context. Solutions can fall into one of the five CycleHack categories; digital, physical, policy, local plan, event/campaign. Hacks will be loaded to the online open source catalogue to show how the ideas can be replicated. Prizes will be awarded to the best hacks. CycleStreets is one of the partners organising the event. We’ll be on hand to help out and give advice to people considering doing a digital hack. Perhaps you’ve never used an API (a data interface – like the CycleStreets API for instance) before or don’t know what it is? We can help you get started. Cambridge Cycling Campaign is the main organiser of the event. Other partners include the Smart Cambridge Programme (Cambridge County Council) and CoDE Research Institute at Anglia Ruskin University. There are more details on the Facebook event page about the event, and you can register online. The efforts of several local organisations and companies to get more people cycling in the Cambridge, the HQ of CycleStreets, has been recognised in the inaugural Cycle Planning Awards. The awards ceremony is being held in Walthamstow, London on 14th September. CycleStreets is a finalist in the ‘Best Innovation’ category for its free-to-use journey planning website. CycleStreets runs the UK-wide cycle journey planning website and provides data feeds for a wide variety of journey planning websites and apps, as well as crowd-sourced data collection and collision data viewing systems. They aim to help encourage new people to cycling, by giving them information on where it is convenient and pleasant to cycle, as well as helping existing cyclists find good routes that improve on their existing journeys or help them through unfamiliar areas. Outspoken Training based in Cambridge are a finalist in the ‘Best Behaviour Change’ category for their work on a project called Bikeability Plus, which has operated in both Peterborough and in Cambridge. The overall aim of the project was to help build a better cycling culture within five primary schools and to encourage children, parents and teachers to cycle more often. The overall target was to increase those cycling to school at least once per week by 20%. The actual result was a 263% increase with more than 200 more children cycling to school each week. Finally, Cambridgeshire County Council’s Mike Davies is a finalist in the ‘Cycling Champion of the Year’ category, for his work on leading innovative cycling projects. He was nominated for the award by Cambridge Cycling Campaign. He shares the final in this category with the Mayor of Leicester, the Deputy Leader of Waltham Forest Council and the Regional Development Minister from the Northern Ireland Assembly. Mike said “I’m delighted to be a finalist in this award category. The work of many people including Council officers, Councillors, campaign groups, local businesses, cycle shops, schools and colleges, has all contributed to the success of cycling in and around Cambridge, and this is vital to ease traffic congestion and improve people’s health, independence, and ability to access employment and training in a growing city area”. Please join us in welcoming our new intern, Patrick, who is working over the summer as a paid employee on the CycleStreets code. He’ll be working to add new API calls, add new features, refactor older code so that we can move the codebase forward, templatise sections so we can redesign them, and more. Patrick, tell us a bit about yourself. I’m a post-grad student at Cambridge University, studying Education and Choral Studies. What are some of the programming projects you’ve worked on before? I had a great time in Germany connecting a massive pipe organ to a MIDI enabled interface, and playing that huge instrument from my computer. More recently, I programmed a music generator in PHP which creates random pop music. What interested you in getting involved in CycleStreets? I’ve always gotten around by bike in Cambridge and Düsseldorf, and I used the CycleStreets app quite a bit before seeing the blog post advertising the summer intern position. What are you most keen to improve in our system over the summer? Adding API calls is quite satisfying work, because it’s very exciting to see how developers implement these calls in their apps. What have you been working on in your first week, and how is it going? I’ve been focusing on splitting some functions into page, model and api classes, which facilitates templating the layout of the site and cleans up some messy code. I’ve also added some new functionality to Galleries. Patrick will be posting over the summer on the fruits of his labour. CycleStreets is seeking a Cambridge (UK) -based intern over the summer, to help us improve our codebase quality. Over many years we have built up a very large codebase, which runs our Journey planner and Photomap. There are also other sections, such as a collision data viewer, points of interest pages, a (somewhat out-of-date) help/about section, geocoder, user profile system, information pages, etc. This codebase primarily consists of over 225 PHP classes, averaging about 500 lines of code each. Interactive elements of the site are underpinned by a stable API. We are in the middle of a major redesign (hence our quietness on this blog lately!) to solve various usability issues, modernise the look and feel of the site, add new facilities such as drag-routing/waypoints, and fundamentally unify the many sections of the site into a coherent whole. We have a powerful API under the hood, but we feel this is not reflected positively in our user interface. We are sometimes slowed down in development by older code, pointing to the need for refactoring in several key areas. For instance, we want to complete our migration to a fully-templatised MVC structure. We want to deprecate our current mobile website by making the new design responsive while retaining the mobile site’s current innovations. We want to replace direct database calls with new API-based calls, so that the site effectively becomes a fairly independent consumer of its own API. The two-month paid internship will be based in Cambridge (UK). We consider that regularly in-person discussions are likely so that the code can be understood properly before commencing with refactoring. The intern will be hired as an proper salaried employee, and we understand that a going rate in the area for an internship is around £380/week; we will also come to a flexible arrangement regarding working locations and/or expenses for public area working to ensure that the successful employee is never out-of-pocket. A desire to promote practical cycling and support the cycle advocacy movement – we want someone who believes in what we’re doing, rather than just seeing this as a general coding job. We are not expecting someone with many years of development experience, as such a person would be in a stable job, and the salary level is not intended to reflect this. What is more important to us is someone with the right mindset, a fast learner, who can work at a good rate. Being an internship, this will be a two-way arrangement, with us helping give the student knowledge of working in a large codebase and the challenges this brings – though we do want someone who is a self-starter that doesn’t need prodding constantly. To apply, drop us a line via e-mail by the end of Wednesday 17th June 2015, explaining your interests, with your thoughts on our site (such as a critical analysis, maximum 2 pages at most), and point us to any code you have written (public code on Github is always a good sign). 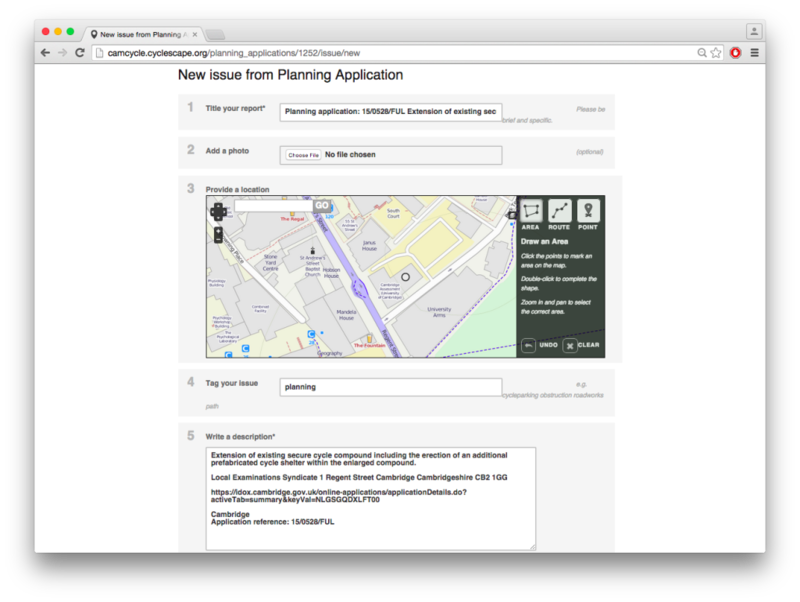 We’re very excited to announce a major new feature on Cyclescape, our online toolkit for cycle campaign groups: integration of planning applications, which we pushed live last week after much work over the last 18 months. 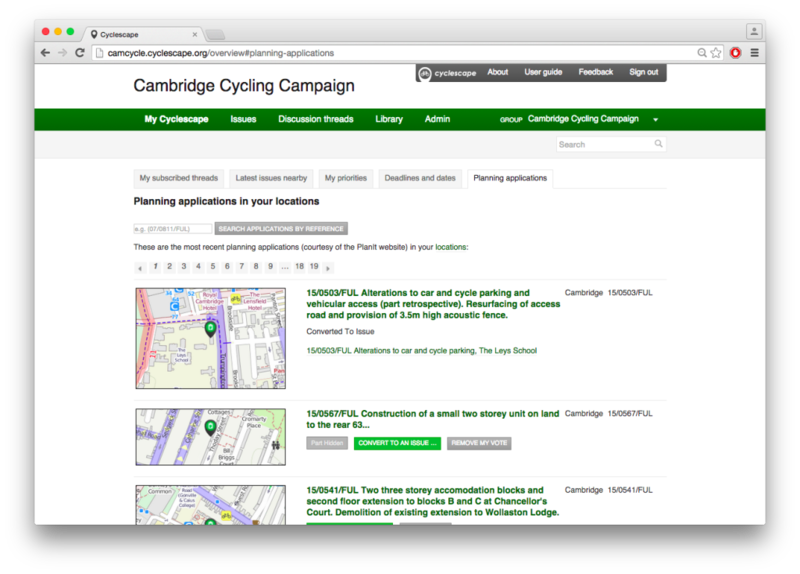 Cambridge Cycling Campaign is the group we’ve been testing this with and where the work has mainly been undertaken. This is 6 weeks of extra time to talk to the developers, and the Council, rather than deal with everything last minute – e.g. just before it goes to Planning Committee, as has happened in the past! As there is no way for us to determine automatically (yet) whether a planning application is relevant – and there is a lot of irrelevant stuff like tree works – we have provided a button to enable an application to be hidden. If enough users in the group vote to hide the application, it will be hidden for all. In this way, group users can crowdsource relevant applications, and make it faster for others to work through to find relevant things. Not all areas of the country are yet covered – Cambridge, featured above, has been specially funded. We’d like to thank Cambridge Sustainable City for their grant support. We’d like to thank our developers Andy Allan and Nikolai Berkoff, as well as Andrew Speakman whose work has made this possible. This year the Cambridgeshire Cycle Challenge is running from Monday 15th September to Sunday 12th October and is a fun and FREE web based competition to see which businesses can get the most people cycling over the four week period. There’s still time to sign up! The Challenge is open to all businesses in Cambridgeshire and aims to increase the uptake of cycling by encouraging more new people to cycle to work and spur on people who already cycle to do so more often. Following on from Le Tour de France’s exciting visit to Cambridge and South Cambridgeshire in July, the Challenge is a great way to continue the cycling spirit. Any member of staff can take part by initially registering on the challenge website. Once registered participants record every journey they make (both to work and for leisure) during the four week period, on the website via computer, or on a tablet/smartphone. For tablet and smartphone users a PleaseCycle mobile app is available for free to download and includes GPS functionality so that journeys can be tracked as the user cycles and are automatically logged to their account. There are lots of prizes for different categories of riders (e.g. novice, rusty rider, intermediate and advanced), awarded weekly as well as overall winners – so regular cyclists will not ride off with all the prizes! In addition prizes will be evenly distributed around the districts of Cambridge City, East Cambridgeshire, Fenland, Huntingdonshire and South Cambridgeshire. The website also includes facilities to enable employer office locations, departments and teams to compete against one another as well as other employers. This is a great way to encourage friendly rivalry and at the same time promote cycling. The Challenge is being run by our friends at PleaseCycle and Outspoken on behalf of Travel for Cambridgeshire (formerly the Travel for Work Partnership) and Cambridgeshire County Council. We’ve refreshed the mobile section of our website, including new screenshots, updated feature lists, and a new page about our mobile web site. These apps would not have been possible without the enormous efforts of volunteers working on these open source projects. Thanks all! Do consider getting involved if you are a developer.